During the middle of our time in Sydney we decided to take a day and travel to Canberra, the capital of Australia. Getting to Canberra from Sydney requires a 4-hour train ride, so that means in order to have any time in the city to see the sights, we needed to get up before sunrise and get on the first train of the day out to Canberra. However, sometimes the best laid plans get waylaid. A day or two before we were supposed to travel to Canberra, we received an email from the train company that due to work being done on the track, the train trip that we had already booked would be switched to a motor coach trip instead since we obviously couldn’t get on the train. There was nothing to be done about it but make the best of the situation. So we left Sydney at 7 am on a 4-hour motor coach trip to Canberra. Once in Australia’s capital, our first stop was to the Australian War Memorial. Out of all the museums I’ve been to around the world, I’ve never been to a more interesting war. The museum focuses on Australia’s involvement in various world conflicts, but with a special emphasis on World War I, which I’ve not seen at other museums. 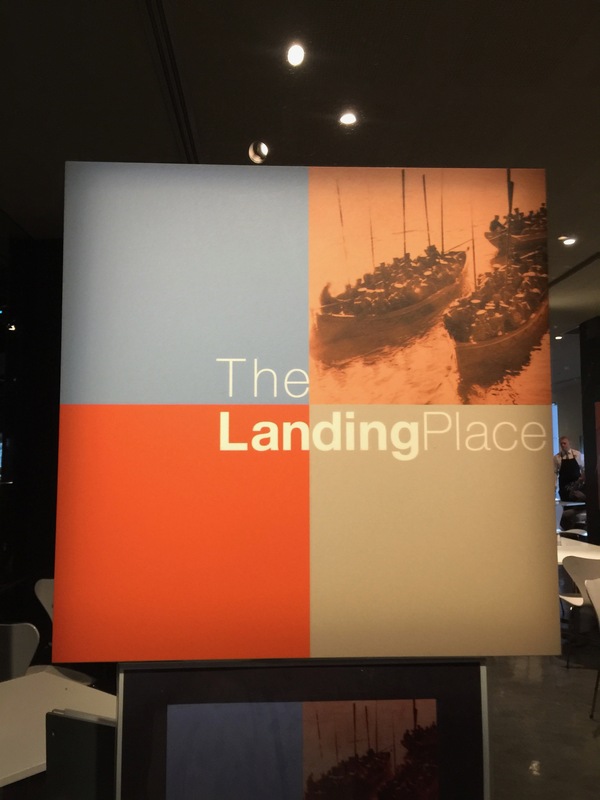 After a couple of hours walking around the Australian War Museum, my husband and I decided to stop into the museum’s cafe, appropriately called the Landing Place, to grab some lunch. It was a cold and rainy day, and we were looking for some hot and filling food to give us energy through the rest of our long day in Canberra. Since we left the hotel so early to make our motor coach, neither of us had breakfast at the hotel, so by the time we found ourselves at The Landing Place, we were both starving. The Landing Place had pre-made sandwiches and salads and desserts displayed in a refrigerated case that you could just choose from. Or, they also had a limited menu from which you could order for the kitchen to make and have delivered to your table. As my husband and I were looking for hot food, we both decided to order off the menu. I ordered a Peri-Peri chicken schnitzel burger with fries. The peri-peri chicken schnitzel burger was absolutely delicious. 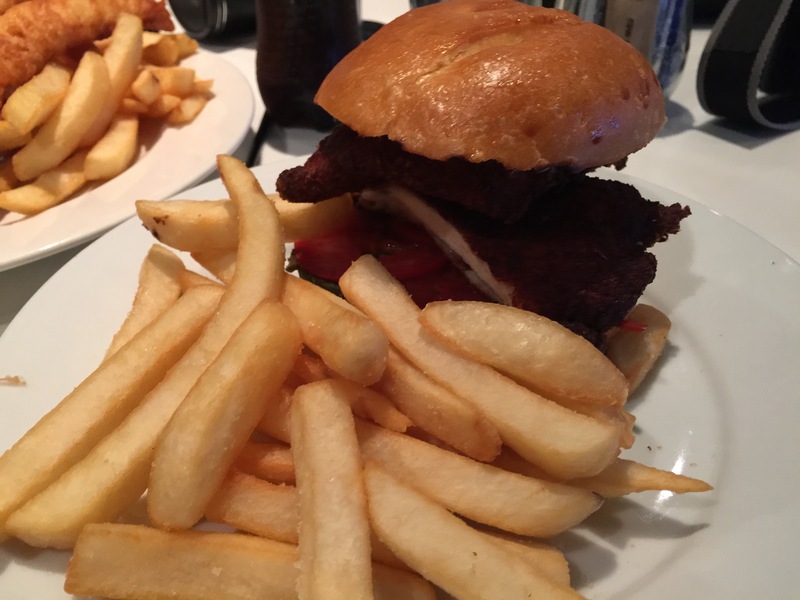 With only a brioche bun, tomato slices and lettuce, the star was the chicken schnitzel. The schnitzel was very well made with tender chicken which was pounded thin, and a terrific batter that was deep-fried to a crunchy texture. The batter stayed on the chicken very well and didn’t fall apart as I ate the burger. The flavors were simple, but delicious and everything came together really well. The brioche bun was perfect for the burger, and the sweetness and acidity from the tomatoes played off of the tenderness of the chicken. This was just a well made burger. The fries were terrific as well, hot and crunchy on the outside, but fluffy and tender on the inside. I am a huge fan of these big steak fries because you just get the terrific contrast of crunchy and a lot of potato body. All around, this meal was really filling and very tasty. 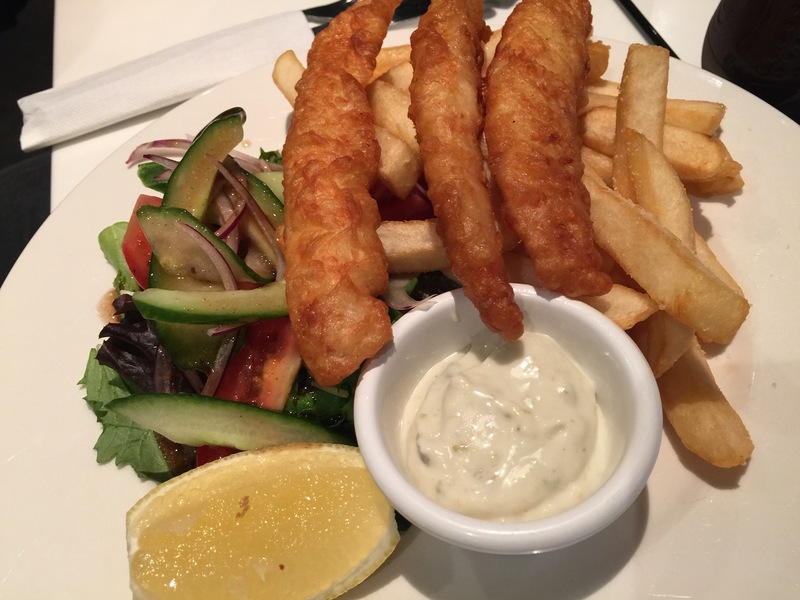 My husband decided to order the special of the day which was battered fish and chips. Served with a side salad, tartar sauce and a wedge of lemon, this was a full meal. Squeeze of lemon over the battered fish, and the fish was terrific. The batter was light yet crunchy and held up well with the fish, which was flaky and light in flavor. This was what battered fish should taste like. The chips were, again, crunchy on the outside and fluffy and hot on the inside. The salad, my husband gave that to me, and I enjoyed it, with a light and tangy dressing, the salad was made with mixed greens, tomatoes, red onion and crunchy cucumbers. My husband was super happy with his order of battered fish and chips. These meals really just hit the spot. Being that it was rainy and cold outside, and The Landing Place had a nice coffee machine and a barista who knew what they were doing, I couldn’t leave without ordering a latte. A little milk art later and the latte was delivered to the table with a milk leaf atop the steaming hot combination of espresso and steamed milk. 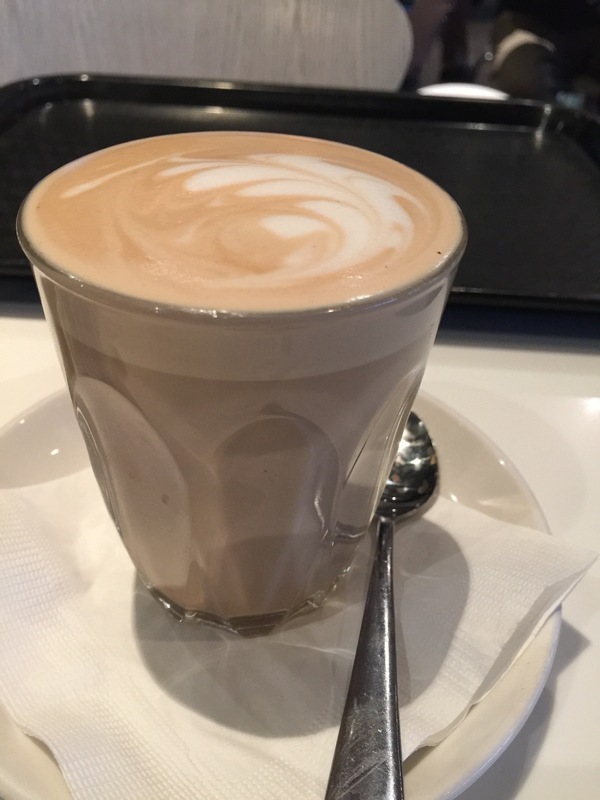 This was an amazingly delicious latte with a terrific balance of steamed milk that the drink was foamy and luxurious. After a morning of walking around the beautiful Australian War Memorial, sitting down to an amazing cup of coffee was just icing on the cake, so to speak. The Australian War Memorial in Canberra is an absolutely fantastic, educational and emotional place to visit. 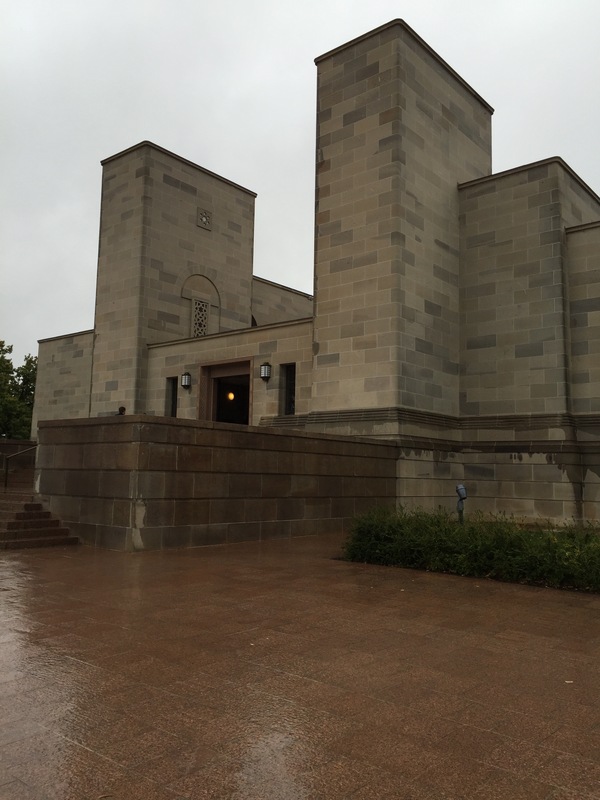 After riding a motor coach for 4 hours, traveling through the rainy city to get to the War Memorial and walking around for a couple of hours looking at the various exhibits, my husband and I were hungry. Since the Landing Cafe was right there at the Australian War Memorial, we decided to sit down and enjoy a much needed lunch break. What we got was an incredibly tasty and filling meal that provided us with the energy to keep going for the rest of the day. All the food we ordered hit the spot, and the warm place to sit and rest our feet for a little bit was a welcome respite as well. If you ever find yourself in Canberra, you must visit the Australian War Memorial, and poke your head into the Landing Place, if even only for a hot cup of coffee.